It’s done! YAY! 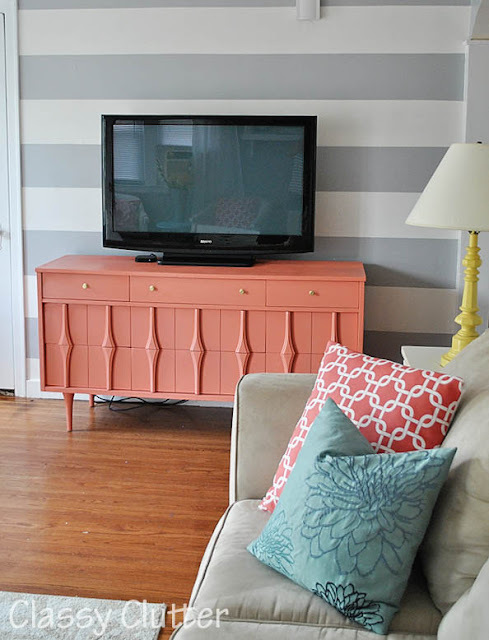 Little refresher: I am adding lots of color, including coral, to my living/family room. 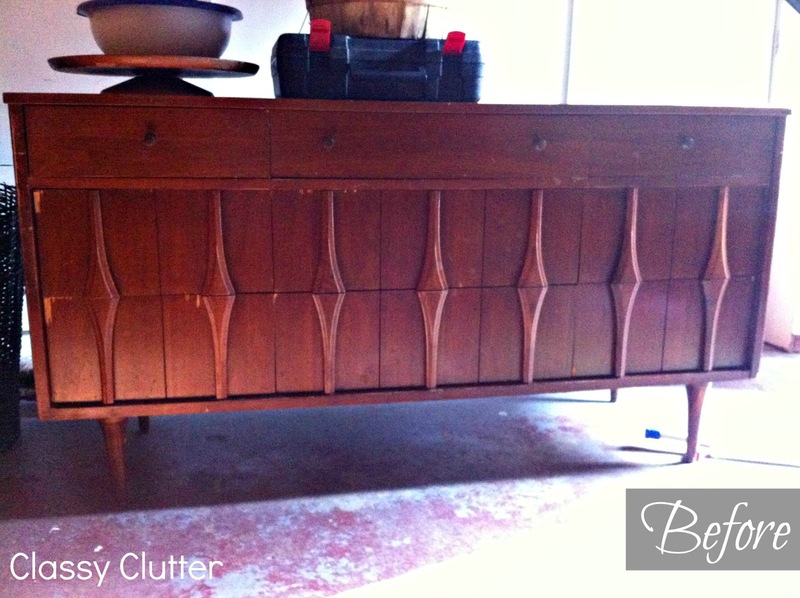 I picked up a dresser than I planned on using for a tv console a few weeks ago from a yard sale for $35. My limit when buying used furniture is $40 so I was happy to keep this purchase under that. I was super nervous about painting a big piece a bold color but with a little nudging from a few of my dear friends, I DID IT and boy am I in LOVE with the turn out! …and here she is after a few coat of Sherwin Williams “Emotional” mixed with a bit of white paint. 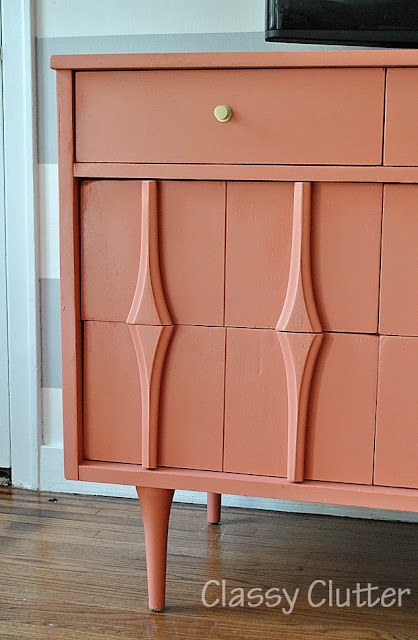 I really love the legs, the detail and the little gold knobs! Man, I love it all! What do you think? Are you a coral + gold fan?? I love Coral! I just redid my bedroom colors in corals and turquoise! (http://thesepiapuppy.blogspot.com/2012/08/furniture-revamp-challenge-final-reveal.html) however I used silver instead of gold. I love Coral! It’s so pretty! It tuned out beautifully…..the color is gorgeous!!!! It looks AMAZING!!!!! Way to go Mallory! SWOON!! i thought i was over my fling with coral…. but now i am not so sure! this piece is AWESOME! i pinned this baby , oh yeah. Looks so awesome.. you did a fantastic job.. I love it! Love that color! You have inspired me with your decorating. I just love your taste. Swoon*** This turned out absolutely awesome! I love the color and you can’t beat the price!! I absolutely love it!! What a gorgeous piece! Oh my goodness! I love the lines of this piece and the color you chose!!! Love this! Awesome painted dresser + awesome striped wall = totally awesome! There are no words to describe how much I love this. It’s perfect in every way. Would love to have you share it on my weekend linky party! 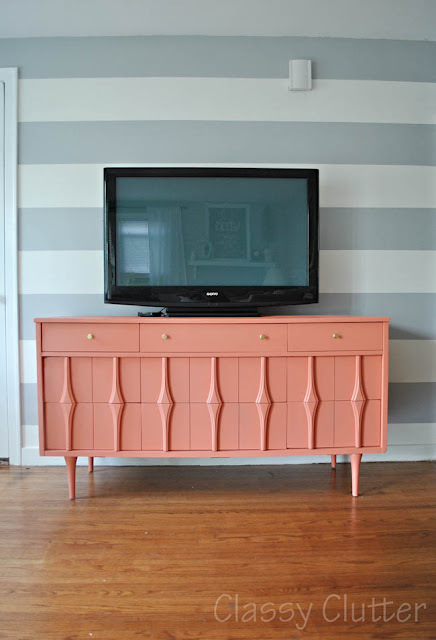 I do love coral + gold and yours looks especially fresh popped against the wonderful gray striped wall. Think the color combo also perfectly suits the retro style of the credenza. I’ve been considering that same color palette for a bathroom and seeing how your room looks you might have made the decision for me. Love this. CUTE! You took a piece of furniture that wasn’t that great looking and made it fab! And I love the coral + gold combo!! WOW! Just saw this on Not Just a Housewife! What a beautiful piece and such a great colour choice. this is too cool! Great job on the color choice – never expected it but really works! In love with it!!!! I have that coral pillow print in yellow, I am loving the coral though! Found you over at House of Hepworths. It turned out so great! I love the coral, what a transformation! Love this! Did you have to sand or prime it first? I am obsessed with the color! It’s gorgeous. In fact the whole dresser is gorgeous! $35 is an awesome deal. The dresser looks especially great against that striped wall. Thanks for sharing! Much improved, not it is a conversation piece! Coral and navy are my favorite colors right now. Love, love what you did with the console. The room is really coming together. Wow! 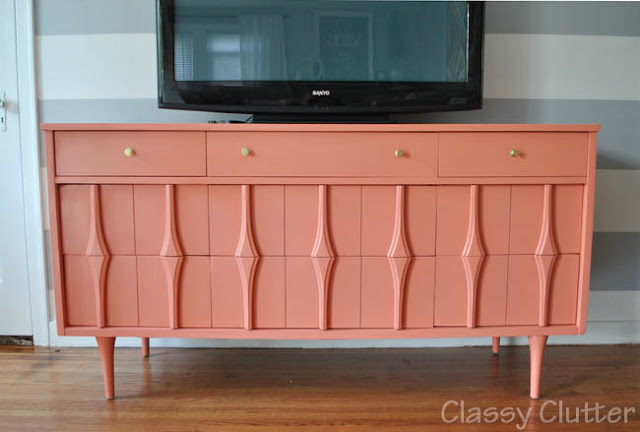 I love this so much, it looks fantastic painted and even before it looks like a steal for $35! What a great design. This is so pretty! I love the coral and gold together. Fantastic job! P.S. I have a giveaway going on right now for some really great hair products (http://www.allonsykimberly.com/2012/11/giveaway-with-flat-iron-experts.html) . Hope you’ll stop by! Super obsessed with this piece! It’s amazing! Love the piece, the color and the gold knobs! Perfection! Oh my goodness.. it’s gorgeous!!!!! Love this!! You did a fantastic job and the color is so amazing! Gorgeous! Be still my heart. Love! Very cool makeover! Color is unusual but totally works! My boyfriend and I bought the same dresser and its taller counterpart at an estate sale last year but I’ve been going crazy trying to figure out what to do with them. Painting them was scaring me off but this turned out really well!! Thanks for the inspiration! I also just got the same dresser (free!!!!) from an estate. I noticed yours is bowing in the middle a bit. I checked out my dresser and yours is missing a middle leg that’s set way in the back of the dresser. Also thanks for the idea of painting the entire thing! I was just going to do the drawers or just the surround but I love this so much.